You mite want to check it out! Your chickens’ bottoms that isÂ â you know, the area where the egg comes out in a hen and the area on the roo where he can make that same egg fertile. If the area appears dark in color and seems to be moving (E-Gads), your bird probably has a case of MITES. Now that I’ve got you all itching and paying attention, I’d like to cover some basics on mites from a poultry health point of view. There are several kinds of mites including the Red Mite and the Northern Fowl Mite, but I’m going to let you research the different mites on your own. I’d like to address the overall health of your birds and the damage that something as simple as a mite infestation can do. I’ve witnessed an otherwise healthy bird be downed by a mite problem. A severe infestation can lead to anemia and can easily kill a good bird in three days if untreated. 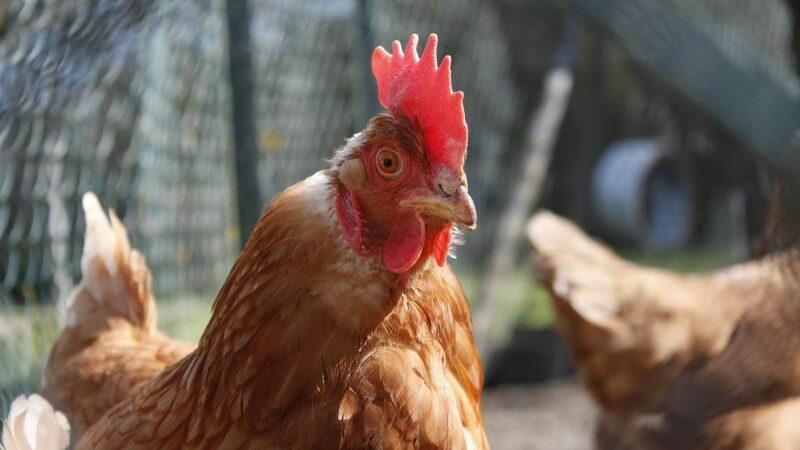 A classic symptom of a mite infestation (other than physically seeing them through physical examination) is paleness in the comb and/or wattles. If your bird seems depressed, sulks, and is pale in their skin color, then the first place I would look is the vent area. Although infestations can occur in other areas of the bird, the vent area is the most likely since the mites can get their moisture from that area easily. Other areas to pay attention to are in the ears, on the thigh, and in the neck area under the hackle feathers. Also look for scabbing on the skin, which would indicate that mites were there and may have moved on to a more desirable part of the body. Once you find a mite infestation on your bird, the treatment course will vary depending on the severity of the problem. If you have a minor problem, simply spraying the bird or dusting it once and then again three days later can usually do the trick. You may also want to replace their bedding and use poultry/livestock dust or Seven dust underneath the new bedding. If you have a very severe infestation, then the following is the course of action that I find most successful: The day you discover the problem, determine if it is isolated to one bird, or the whole flock. I’ll outline treatment for one bird and you can adapt that to a whole flock, using a common sense approach. The first thing I do is spray the bird in the infested areas with Adams Flea and Tick Mist for dogs (avoiding eyes, ears, and the actual vent, although above and below the vent may be imperative). Then I treat the bird with either an injection of Ivomec (Ivermectin) or using one of the ‘pour-on’ Eprinex products. You’ll have to calculate the dosages based on the particular livestock product you use. Seeking the help of a local Vet on dosage may be helpful. I immediately get the bird on a mineral supplement (a combination product of vitamins, minerals, and probiotics is best, but I’m looking to boost iron overall). Within 24 hours of treatment with the Adams Mist, I bathe the bird with comfortably warm water and Adams Flea and Tick Shampoo for dogs (do not get this into the bird’s eyes or ears). This should take a while as I make sure that I not only wash out all of the dead mites, but also want to make sure that the shampoo makes contact with any leftover mites that may still be alive. I allow the shampoo to remain on the bird for about five minutes, massaging thoroughly the entire time. Rinse well with nice warm water to avoid chilling and work all of the soap out. Squeeze as much of the moisture out of the feathers as possible over the sink so that drying is easier and quicker. I wrap the bird in a large bath towel and apply light pressure throughout the body to try and get a lot of the moisture out of the feathers and onto the towel. Remember that we are bathing as a medical treatment and not as preparation for a show. Your first concern should be to prevent chilling of the bird, as opposed to the preservation of the feathers. After all, unless you treat this bird correctly, you may not have him any longer in order to show. I use a hair dryer to blow dry the feathers and the fluff underneath to get the bird as dry as possible. I also put a lot of care into trying to do this in such a way that does not stress the bird too much. Every bird is different so you’ll have to use your good judgment on method. Since you can never get a bird completely dry in his fluff, and you’d want to avoid chilling, I recommend that you keep the bird in a carrier in the house overnight to insure thorough drying. You can place him and his carrier outside the following day. Once bathed, you want to make sure the bird is placed in an environment that has been treated for the prevention of mites. Clean out his old bedding, dust the floor of his home with a combination of Seven Dust and Poultry/Livestock Dust (two different ingredients), and place new bedding on top of that. Keep him warm and quiet, and keep the supplement coming along with good supportive therapy for the next few days. Supportive therapy may need to include some treatment of the sores on the body created by the mites biting. I suggest a classic antibiotic ointment such as Neosporin (very sparingly) for this purpose. On day three, you’ll want to treat him again with both the Ivomec and the Adams Mist in order to break the reproductive cycle, and then check him again in another three days from that (treatment at that time is not necessary if the problem is solved – if not solved, stick to the Adams Mist at that time). Mites are a fact of life in poultry keeping and is not something you should be embarrassed to admit if you’re having a problem and need to ask for help. You can run the cleanest operation possible and still pick up mites while showing. If your birds are other wise healthy, you may never even think about checking for this, but I recommend that you do after every show. I also recommend that you do a spot check of all of your birds once a month. I have what I believe is a Orpington rooster. His feathers are a light tan color. He “yawns” frequently, and shakes his head, like he is trying to shake something off. What the yawning is from, I have no idea. He looks like he is trying to swallow something. He does this repeatedly, and, he is, right now, confined to a Rabbit cage. I was going to cull him, but changed my mind. He is of more value to make chicks than he is providing one or two meals. So, the issues are the yawning, and head shaking. I did dusty him with Sevin, but probably did not do a good enough job.